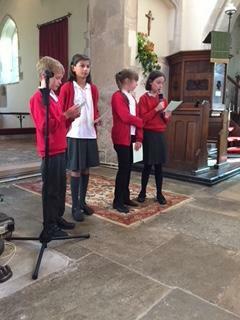 Our harvest service was a wonderful opportunity for our children to lead in worship. 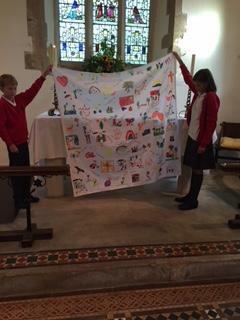 Year 6 children led the service while our school council and other children wrote prayers, poems and songs. 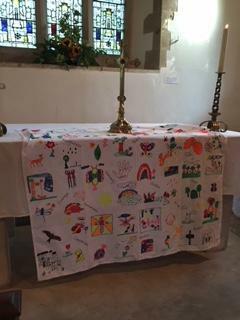 Rev Des blessed our new alter cloth which has been designed by everyone in school with pictures and words about our school. These all reflect our core values. The collaboration of children and teachers demonstrates how we all work together towards our Christian vision for the school. 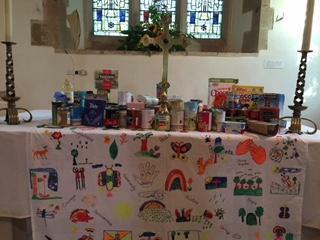 Thank you to everyone who donated tins, packets and boxes of food for our local 'Food Bank'. This is such a worthy cause and everyone's generosity will go a long way to helping local people in times of difficulty.